Any fears I had of breaching superhero saturation point have been keenly banished to the astral plane by Dr. Strange, Marvel’s latest instalment in its pervasive and swiftly expanding cinematic universe. On paper, or rather parchment, four Marvel movies in one year strikes one as overkill, in yet another season marred by reboots, remakes and resurrections, pushing any potential originality or inspiration out to the margins of the art house or independent film arenas. I didn’t have any specific investment in this particular project, I quite like the character from my comic book collecting youth but he was never exactly a favourite, and the trailer while intriguing made me react with mostly a ‘hmm, I think I’ll check that out’ rather than any sense of enhanced enthusiasm. The rather obvious casting of Benedict Cumberbatch also made me raise a quizzical eyebrow, I’ve never quite understood the devotion he inspires, while he’s been very good in some things he’s been throughly predictable in others, although, to be fair I’ve not seen some of his highly regarded work such as Sherlock which I’m told is solid OCD orientated entertainment. Furthermore I re-watched Civil War a fortnight ago and some of the action set-pieces aside I was mostly bored, caring very little for the characters or their throughly tedious struggles, so it seemed that the sheen of the Marvel franchise was beginning to lose its lustre. Nevertheless like a good soldier I ambled over to the multiplex this weekend, buoyed by strong word-of-mouth and an eerily appropriate bout of fog shrouded weather which has blanketed London all day. I now consider my chakra’s re-energised and my transcendental ascension complete, as this is one of the years best blockbusters, another bolt of bedevilment in the heart of Warner Brothers faltering film failures. Here we have an origin story which can get a little stale after their numerous iterations, but when they are handled so proficiently you really can’t complain, the conceit, fall from grace and subsequent renewal the benchmark of hero films that align with the Hollywood three act structure, flayed with a mind bending para-reality twist. 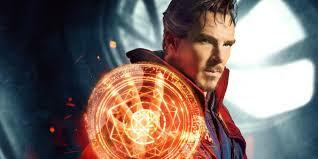 Like the first Iron Man picture we are introduced to an arrogant and brilliantly skilled protagonist, the brilliant neurosurgeon Stephen Strange (Cumberbatch), Strange and Stark two peas in the franchise product pod. He’s a man who has everything, the Manhattan penthouse suite, the seven-figure sports car, the sartorial closet that would make Saville Row swoon, and a burgeoning romance with his surgical colleague Christine (Rachel McAdams). All this crashes to the ground after his hands are decimated in a violent car crash, forcing Strange to frantically seek solutions beyond western medicine in order to resurrect his crushed career. 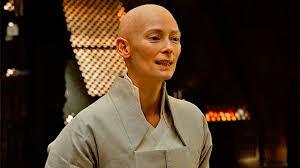 When he hears whispers of another crippled soul who managed to overcome his ailments his journey leads him to Kathmandu, in search of the fabled Kamar-Taj, where a mystical seer known as the Ancient One (Tilda Swinton, baldly brilliant), her major-domo Mordo (Chiwetel Ejiofor) and their coven of mystical warriors protect the earth from para-dimensional threats through their mastery of sorcerous powers. A pre-credit prologue hints at a sinister plot which is engineered by Kaecilius (an adequate Mads Mikkelsen) who has rejected the teachings of the Ancient One in favour of a hidden and immensely powerful force, seeking immortality and a new epoch of order and bliss if only those pesky ideals of free-will and harmony are sacrificed at the altar of a near omnipotent and infinite entity. If that all sounds a little too spiritual then no fear, this is an action orientated blockbuster through and through, as for a coven of transcendental monks they sure enjoy knocking seven shades of cyttorak out of each other to solve their problems and maintain the secret and shielded equilibrium. So, first things first. Visually, the film is staggering, perhaps too much to take in even on the biggest screen possible, with almost every pixel fluctuating and morphing in the films most extravagant set-piece scenes. In that sense I’d say 3D is a must if you are comfortable with the format, genuinely adding a depth and dimensional delirium, and on that front alone I am seriously contemplating a second big-screen viewing. Yes, a lot of sneering nerds have dismissed the film as Matrix-lite or little more than an Inception clone from just a brief glimpse of the trailer which are both obvious visual references, but Dr. Strange takes those perception perverting designs to omni-dimensional plateaus, warping and weirding reality in a throughly bewitching way – it feels fresh and genuinely exhilarating in the blockbuster format which hasn’t been so confidently conceived for quite some time. 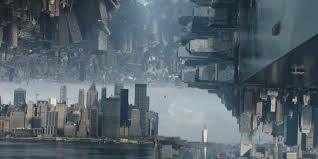 Strange’s initial introduction to the para-realities beyond mortal comprehension is a transcendental tour-de-force, and these sequences are the films strengths which manage to camouflage some of the more traditional plot definitions and designs, which faithfully follow in the the usual superhero footsteps of the hubristic fall and rise. True, there might be a bit of overkill as the sheer onslaught of visual information is a little difficult to process sometimes, such is the density of the pixellated pandemonium, but that’s why the lord invented Blu-ray’s and 4K playback systems didn’t s/he? As someone who has never felt kinship with the cult of Cumberbatch he nailed this performance, being an arrogant, insular egomaniac thrown on a journey of self discovery, with a genuine arc which was satisfied by the films clever climax. It’s here that Dr. Strange cleverly and confidentially cleaves closely to the properties sequential storytelling origins, utilising intellect and guile rather than strength and combat in order to overcome para-dimensionally oppressive foes. As pointed out by wiser souls than I it’s also amusing to see a major Hollywood blockbuster pilfered by not one, not two but no less than four British thespians, as Bundersnatch, Swinton, Eijofor and Benedict Wong all acquaint themselves admirably, the latter as an initially humorless warrior monk arrayed with the forces of good. This entry was posted on October 30, 2016 by mintyblonde. 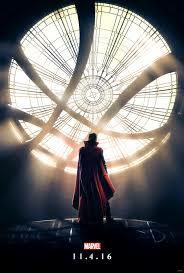 It was filed under Film, London and was tagged with BFI, Cinema, Cumberbatch, Dr, Film, London, Marvel, Movies, Strange.